All the twenty-five riders with us were experienced on Continental roads. Apart from myself and one other none had experienced riding on Corsican roads or the Corsican driving styles. They were in for a surprise! The group was a mix of 12 BMWs, 6 Hondas, 3 Triumphs, a Suzuki, Harley Davidson, Kawasaki and a Ducati. Ten with passengers and fifteen riding solo. They came from far and wide to escape the speed cameras and crowded roads of the UK the furthest travelled was from Co Durham and the closest to Dover was Herne Bay a mere 10 miles to the port. I was back on a BMW after an interesting session on a SilverWing scooter and another year on a Honda CBF1000. Having ridden the first K1200GT to St Petersburg a few years before I new what to expect from the K1300GTSE. I wasn’t to be disappointed. I was excited about this trip and I couldn’t wait to experience the riding qualities of the bike over a serious ride that would certainly warm the oil up. This bike is a no holds barred serious tourer, it has all the whistles and knobs that the touring biker would put on his ‘wish’ list and it does everything so very well from luggage capacity to suspension control. Not all the group met at Dover, a couple had left UK a day earlier to take a more leisurely ride to the first hotel, another rider came across from Southampton, others found it more convenient to take the ferry into Zeebrugge. It’s a plus point about these tours as the travel arrangements are flexible and you are free to take your own routes to the rendezvous points. Notching sixth gear on the A26 autoroute towards Reims the smoothness and ride comfort behind the fully adjusted electric screen was magic. 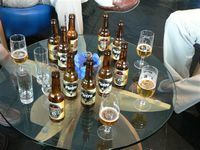 We held a steady legal limit – and sometimes pinched a bit more – no buffeting and no adverse comments from the pillion seat, we were off to a good start. The onboard computer gave a creditable reading of 48mpg I was happy with that. The ride through the wonderful rolling vineyards of the Burgundy countryside was great and meeting up with our friends at the first hotel in Beaune made the arrival even better knowing that most of the group had made it to the first hotel although there was still more to join us on route. Next day we had the 350 miles down to Toulon on a mixture on ‘N’ and ‘D’ roads. Our suggested route took a short stretch of autoroute to Tournus, Bourg en Bresse (where the famous white chicken with blue legs come from) and onto Belley and Grenoble before picking up the Route Napoleon around Sisteron. The French transport Ministry are phasing out the ‘N’ roads making them a ‘D’ classification with a prefix number just to confuse us travellers. These days it seems best to follow place names and GPS instructions rather than road numbers. We picked up traffic heading for Aix en Provence but the agile GT and instant throttle response made passing manoeuvres a cinch. Under normal riding the motor felt docile and perfectly balanced but when called upon 160BHP produced so much torque it almost made changing gear redundant. The rugged scenery of this wonderful part of France deserves more than a passing journey. 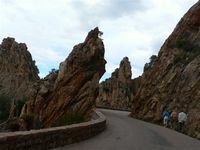 As nice as Burgundy is the dramatic grey rock formations that border the route down to Aix en Provence can set your heart pounding at the thought of hairpin bends and sheer drops. At first we had planned to sail from Nice to Ajaccio but Corsica Ferries, bless them, messed up our plans and changed the schedule to depart from Toulon. Not a problem in terms of mileage but not being familiar with Toulon hotels and their location to the port could present a small problem. Hoteliers can make life difficult and this was the case down at Toulon. In the age of communication we found communication difficult. 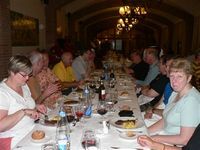 It wasn’t until two weeks before arrival that we had confirmation of rooms, price and meal availability. But on arrival the welcome was great and the arrival of two more riders made the group complete. Evening briefing spelt out the arrangements for the ride to the ferry port. So that no one would miss the ferry we would ride in convoy following a taxi to the departure lanes. This idea worked well, all but one rider was up ready but with the taxi waiting we went. I was pleased to say all made the ferry in plenty of time for the 08.00hrs departure time. Checking in was a well organised shambles. At the port an official zapped the bar code on the ticket directing us to the waiting yellow Corsican Mega Express ferry. With the bike safely stowed against the bulkhead we settled down for the six-hour crossing. The first experience of Corsican traffic came during the scrum as the ferries cargo spilled onto Ajaccio but this was Corsica. Being pushed along by the following traffic there was no time to hang around for the group we forced our way out of the city in temperatures hovering around 40degrees. 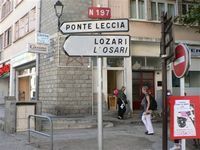 It was an exciting ride to our hotel in Propriana. The road dips and dives following the coastline. No need to use all six speeds in the box here fourth was the tallest needed. The GT mirrors are brilliant and necessary, Corsican drivers follow you closely seemingly never aware that traffic comes towards you as well; they will pass in the most unsuitable places. Its wild, its Corsica! From time to time we could get a glimpse of the shimmering sea and rugged coast through a gap in the roadside foliage. On those roads it’s not wise to take your eyes from the tarmac too many times. As far as location is concerned our hill top hotel had a pole position overlooking a bay enjoying a private secluded beach. Suggestions for the free days were, slob about between beach and hotel, visit the amazing town of Bonifacio and its overhanging limestone rock formation or walk into town for lunch in one of the many open air cafes. Without luggage some of the group choose the site-seeing option down to the furthest point south to Bonifacio were the ferry departs to Sardinia. Others strolled to the town. It’s an interesting walk the road weaves its way through a cemetery of grey granite mausoleums. Corsica is virtually an island of rock with very little soil for graves so the burials must be done on the surface. When the road was pushed through those on the extremity were cut off from the main cemetery and perched precariously on the cliff edge no doubt their occupants will eventually experience a second burial, this time at sea. Word about the Corsican sardines spread quickly and the entire group found their way into the scruffy tumble down shack on the beach. 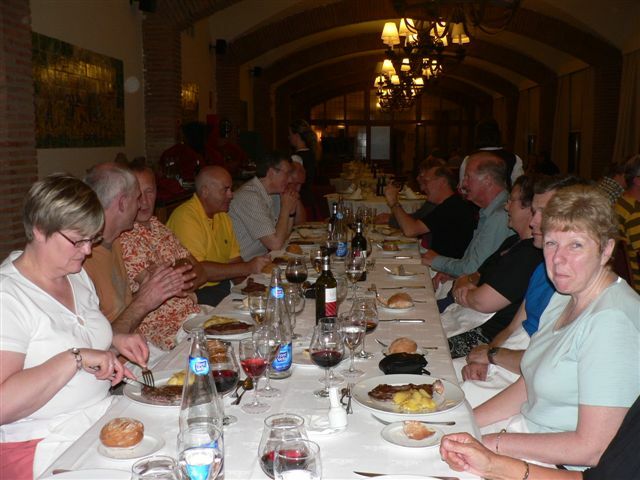 Evening meals were a hoot, the waitress was a ‘foreigner’ and joined in the fun, she came from Savoie (North East France) and was used to Après Ski parties – this was similar she said. With empty bottles of Pietra beer littering the tables and several pitchers of robust Patrimonio red wine – from the same grape that produces Chianti - later and bellies full of the best sardines I had ever tasted we could hardly appreciate the wonderful sunset that had developed out to sea. 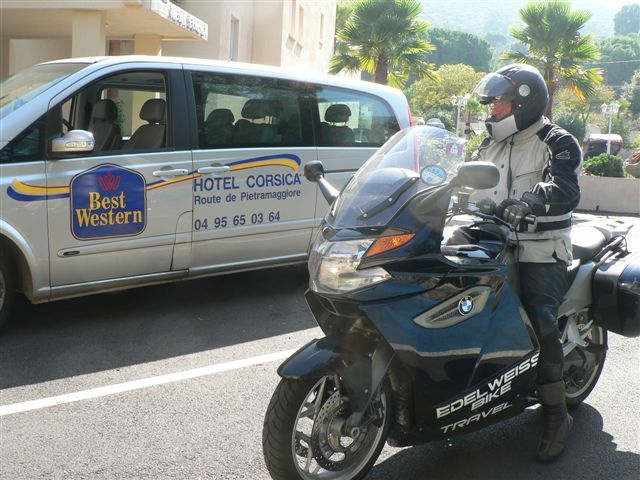 Having explored the southern part of the island it was time to pack and ride what looked like a simple ride to our second hotel in Calvi. Remembering that in Corsica distance is measured in time not miles. GPS and Michelin said it was only 110 miles but what a ride. After Ajaccio the D81 north hugged the coastline it was a scenery overload all the way to Calvi. With the marquis – a mixture of lavender, rosemary, and pine - on the landside and the sea on the other it was truly a ride to remember. The D81 passes through E Calanche one of the most remarkable natural attractions in Corsica if not the Mediterranean. It’s a cathedral of jagged pink granite rocks stretching from way above road level to plunge into the sea. The road narrows to a single lane through the gorge, ok for us, but a nightmare for tourist coaches and one solitary artic who’s GPS had obviously sent him on the shortest route! Lunch was scheduled in Porto, its harbour lined with red granite, pink marble and eucalyptus trees, in the next bay rested Robinson’s boat yard. Arrivals here were positively fired up about E Calanche and wanted to do it again. Continuing on the sinuous coastal road the big GT weighing in at 635 lbs plus luggage handled like a lightweight, speed on these roads isn’t the issue but the light steering and that superb front end suspension made easy work of the demanding road and its unreliable surface. Journeys end that day was a hotel in Calvi that I had used on one other visit. Like many other things in Corsica nothing changes very much. 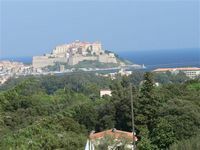 In the distance stands the imposing citadel where Nelson lost his eye during the great siege of Calvi trying to capture the island to gain access to the tall Laricio pines for the masts and spars of his fleet. 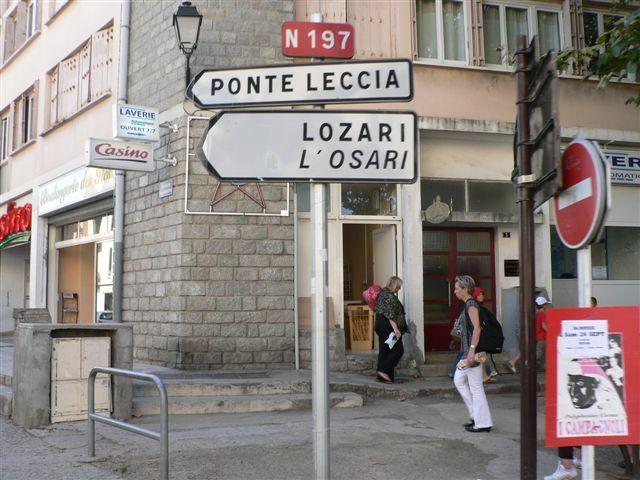 Evenings were no less of an occasion than in Propriano, the allocation of mini bus seats to take us into town was a scramble Corsican style, the culture was beginning to effect us all. The compact town has no shortage of restaurants. I try to eat Corsican if I can, one night grilled red mullet with olives and on another it was saddle of lamb roasted with garlic, finishing with Broccio blue veined Bleu de Corse washed down with a deep coloured Corsican rose wine. It was party atmosphere, balmy temperatures, clear star-lit skies you would find it hard to repeat anywhere else. Remembering the reasons for the convoy to the port at Toulon a mild panic swept through the group we had 50-mile ride back to Bastia and it was difficult to assess journey time. Looking at the map it was more of what we had ridden on the previous riding days. We decided on a departure time of 05.00hrs, it was still dark and these Corsican roads are not easy to ride at night, and was the thankful for the blue/white Xenon head light beam of the GT. We counted everyone in at Bastia and watched the huge yellow Mega Express edge into the quay. Seemingly within minutes we were staring at the Corsican coast disappearing into the distance and the port of Nice getting ever closer. We had time to reflect on the past six days every one had different high points and a different set of memories to look back on. For me it was a combination of several factors. Above all it was the group that gelled like no other group of recent years; the combination of beach at the first hotel and the swimming pool at the second; the weather through out and the character and atmosphere of Corsica it’s so different. Strange that Napoleon didn’t get even get a mention!